Backup just by selecting all macro folders, but which option? So in order to safely backup all my macros and work from KM, which option to choose? "Export macros"? Or "Export Macros as Library"? I am not sure what is the difference? Shall i just select all the folders on the left (image, that is within the selection sqare for illustration purposes)? Perhaps not the "All Macros" pink folder? If your ~/Library folder is hidden (as Apple does by default) hold down the Shift-key when selecting the Go menu in the Finder. Cmd-Shift-L should also open it in the Finder. 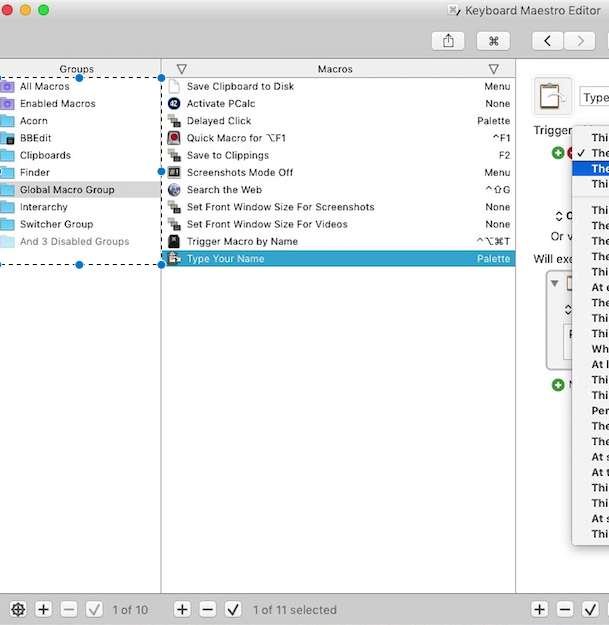 You should always have a find utility on macOS OTHER than Spotlight – one that actually searches your hard drive and doesn't depend upon Apple and their index system. EasyFind is one such and is freeware. It's available directly from DEVONtechnologies and is also on the Mac App-Store. ** NOTE – The specific settings I've used. Personally I prefer Find Any File for this sort of thing. At $6.00 U.S. it's not free, but that money is well-spent. Thanks for the tip about the program etcetera. I finally found it. Seems I have 3 Application Support folders on this mac..... And the last did contain Keyboard Maestro. 1.) 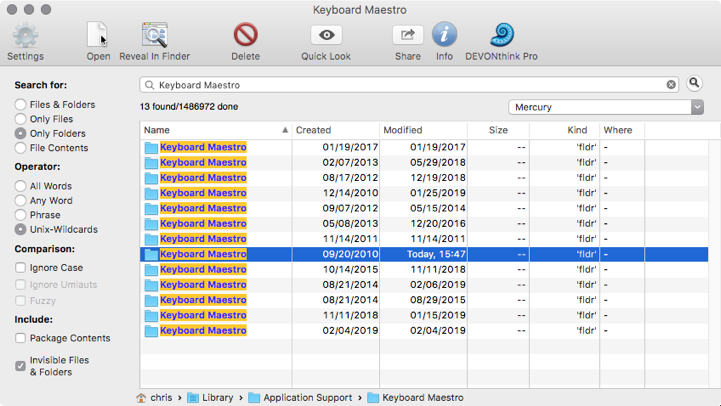 Would it be enough to backup that folder only (Keyboard Mastro within the application support folder)? Will that backup everything I need in order to transfer macroes etcetera to another mac? 2.) Eventual backup of settings.... or other items... is that important? Found it! Thanks for the path! The other 2 Application support folders were not the correct one, but Now I found it. You could get by with backing up just the ~/Library/Application Support/Keyboard Maestro/ folder, but that would leave out some of your settings. I have an AppleScript that saves the Keyboard Maestro (appsupp) folder and the KM preferences to a folder on the Desktop. I also have a shell script that zips the Keyboard Maestro (appsupp) folder to a backup folder. Does that script copy all settings 100%? Even the settings disabled or enabled macro? Does the script work well with High Sierra and El Capitan? Do you have an online user manual? Is this something you sell (the script)? Or how to obtain it? Is this something you sell (the script)? Or how to obtain it? I'll have to clean the script up a little, but I'll be happy to post it.